Council gets a preview of the 2019-20 budget Monday night from Superintendent Katy Grondin. 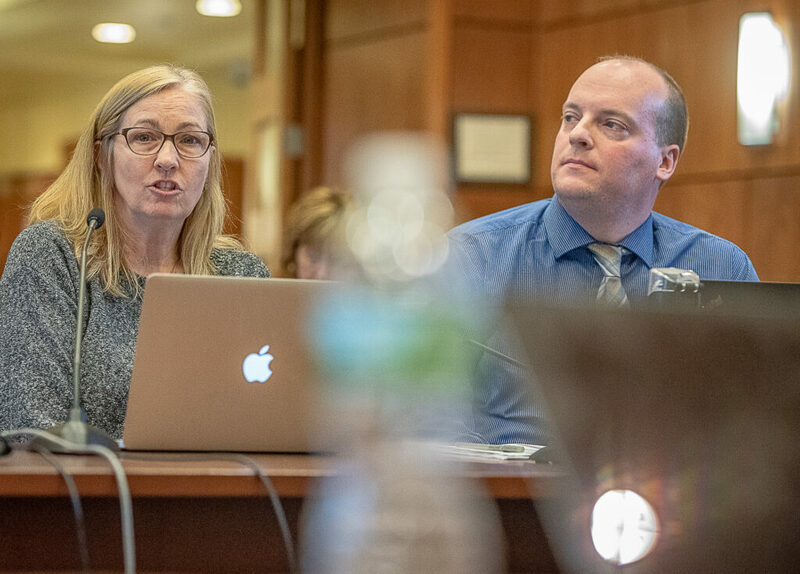 AUBURN — Superintendent Katy Grondin presented a proposed 2019-20 budget to the City Council on Monday that is $300,000 less than last week due to a lower-than-expected increase in health insurance costs. Councilors asked that more cuts be made so there would be no increase to taxpayers. Last week, the budget stood at $45.69 million, a $2 million increase from 2018-19. It would have raised property taxes $36.69, or about 2.7 percent, on a property valued at $150,000. Since then, health care costs rose 7 percent, not 12 percent as expected. That means a proposed budget increase of $1.7 million, which would mostly be covered by $1.5 million in state educational funding. The revised budget would raise property taxes 1.2 percent, or $16 a year for a home valued at $150,000. But several city councilors wanted the budget to go lower, in light of a June 11 vote on a proposed $125.8 million Edward Little High School. The city has to “hold the line as best we can, if not turn the line back a bit,” Levesque said. City Councilor Andrew Titus and Alfreda Fournier said they would like to see a city and school budget with no tax increase. “This year especially,” Titus said. On Tuesday City Councilor Holly Lasagna agreed and said most councilors want the school budget to be close to a zero increase to property taxpayers. “With the vote on the new high school coming in June, we need to show the community that we are sensitive to the inevitability of the tax burden going up once the school costs are bonded,” she said. Grondin said the budget increase is due to 11 new positions, plus three positions new to the budget because a federal grant is running out. Five of the new positions would create an autism program at Walton school for four incoming kindergarten students who need one-on-one care. By law, the district must provide for special education students, Grondin said. Sending them to a program outside the School Department would cost more, she said. Other new positions are an English Language Learning teacher at Park Avenue; an interventionist teacher at the Auburn Middle School for students who need extra support; an interventionist teacher and behavior support educational technician at Walton; and a computer science teacher and a substance misuse counselor at Edward Little High School. Also, the budget would continue paying for three positions at Washburn Elementary School that federal funding will no longer support. Grondin said the positions are needed and her budget is in the interest of meeting students’ needs and fiscally responsible to taxpayers. City Councilor Leroy Walker thanked Grondin and the School Committee for working on the budget. A public hearing is scheduled for April 3 during the regular Auburn School Committee meeting, which begins at 7 p.m. in Auburn Hall. Voters will have the final say June 1.